As the only objective and independent test laboratory, DataMaster shines out in the world of printing. DataMaster Labs perform the same series of tests on each machine. The format of the Opinion we publish has just had a makeover. There is a new layout and new content. The goal remains the same: to help you to sell! Our extensive testing allows us to assess the productivity, quality, usability, flexibility and the functions of printing equipment. 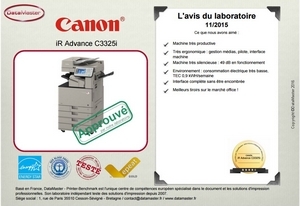 The tests are scenarios reflecting the real-world business environments in which printing equipment is used. Given our experience and what we find in our series of tests, we can say that there have never been so many differences between machines as there are today. So you can digest the results and use them to generate more sales - and faster - our test team's Comments are always available for download from your DMO portal.